API Oil/Water Separators are the performance, safety and environmental standard for petroleum refineries throughout the world. Siemens has been manufacturing API oil/water separators since the 1930’s, when they worked with the American Petroleum Institute (API) to develop the industry’s standard design. The API separator design has been risk-assessed, assuring safe operation. 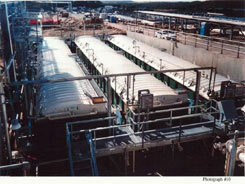 Above ground, steel tankage provides double-containment and visual leak detection for hazardous sludges and wastewater. VOCs are contained through the use of vapor-tight covers. Additional safety features include non-metallic collector components and covers, stainless steel on all wearing metallic components, deflagration vents, flame arrestors, and more. Sludge collection hoppers, screw conveyors, flushing connections, clean-outs, sludge withdrawal piping, and sludge pumps are designed to remove and transfer API separator bottoms with minimal maintenance and operator attention. This is critical because the inability to remove thick, sticky sludges is the main reason the collector components fail in petroleum applications.